Cannabis Therapeutics in HIV / AIDS illustrates the benefits of marijuana in increasing the appetite and easing the trauma of HIV / AIDS patients. 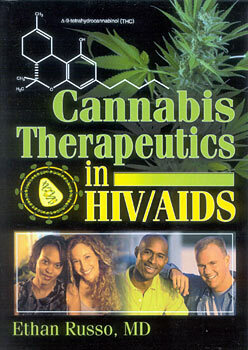 Beginning with a broad medical overview of the subject, the book continues with an insider's view of the twenty-year history of HIV / AIDS and its relationship to cannabis and the medical marijuana movement. You'll also find two studies of clinical cannabis usage, a state-of-the-art review of immunological and pulmonary issues, and a look at alternatives to smoking marijuana, including vaporization, suppositories, sublingual extracts, and aerosol preparations. "An excellent, up-to-date review of the scientific evidence, including an assessment of potential risks. The focus is on the use of cannabis in treating the pain, nausea, and loss of appetite experienced by HIV / AIDS patients-a group for who m there is perhaps the strongest scientific case for cannabis use." "This is the most authoritative reference in a rapidly emerging field. From the history of the medical marijuana movement, through the biochemistry of teh cannabinoids all the way to the value of vaporization, this book provides the reader with an in-depth resource that will likely serve as the primary reference on the topic in upcoming years." "An excellent resource on the use of cannabis for all patients with particular emphasis on the potential harmful effects to immuno-compromised patients as well as practical harm reduction interventions. A must-read for clinicians."